Did the Gurkha Royal Challenge Maduro Robusto meet the hype? Was the cigar tasty? Was it a flop? Find out in this episode what the presenters thought about this famous cigar. It was a balmy 51 degrees on the day that I decided to review the Liga Privada Unico Serie Dirty Rat by Drew Estates. Now 51 may not be balmy in your part of the world, but compared to the ‐4 degree temperatures recently experienced in Maryland… I will take it. I decided to pair this smoke with the Purple Monkey Dishwasher. The dirty rat is available in one size a 5 x 44 corona and the approximate price is $12‐14.00. The wrapper is a stalk cut, sun cured, Connecticut River Valley Habano. The wrapper features a fan‐twisted cap and uses the same wrapper as the famed T52. The binder is a Brazilian Mata Fina. The filler contains a blend of 5 different tobaccos from Nicaragua & Honduras. Pairing: Purple Monkey Dishwasher Chocolate Peanut Butter Porter by Evil Genius Brewing (Bloomfield Connecticut). The Dirty Rat features a dark brown satin finish wrapper with a fan tail cap (I am a sucker for extra features). It feels very compact and give of smells of earth and glue off the wrapper. On the cold draw, I get a pretty good draw and tastes of tobacco & raisin. Upon initial light I am greeted with great smoke output and a variety of flavors including molasses, pepper, tobacco and chocolate. The strength is medium plus with a long oily finish. At this point my mouth is coated with the flavor and strength is beginning to make my head heat up. The Rat started with some pepper, but it is not a pepper bomb. I am continuing to experience pepper with the added coffee and chocolate flavors. On the retrohale I experience a good dose of pepper/spice and a toasted bread sensation. If smoking this one, don’t forget to retrohale (if you are able to). There are definitely flavors that will be missed if you don’t. The complexity continues as I pick up a mineral type flavor along with the coffee and increased toasted bread. Even though the Dirty Rat is a small ring gauge cigar, it is a tasty slow burner that is full of flavor, smoke and complexity. The construction has been spot on and it is burning as straight as an arrow. Throughout my smoking experience, Drew Estate has always been a top notch company when it comes to construction, the Dirty Rat was a tasty treat. Even though it is kinda expensive, I think that it is worth the price. Being that it is a medium bodied cigar, this is a good one for someone who likes mild cigars but is looking to step up to the plate and see what a good medium bodied cigar is all about. The constructions was excellent and the flavors were rich and complex. I would not hesitate to buy and smoke the Dirty Rat again. This cigar is limited in availability, so it is a get while the getting good type of smoke. I would also suggest that you buy at least 2. If you like it, you will have another. If you don’t, you will have a cigar that you can easily trade. Oliva Serie G Double Robusto is a 5″ cigar that sports a 54 ring gauge. This tightly rolled cigar has little veins and an almost perfectly smooth wrapper. 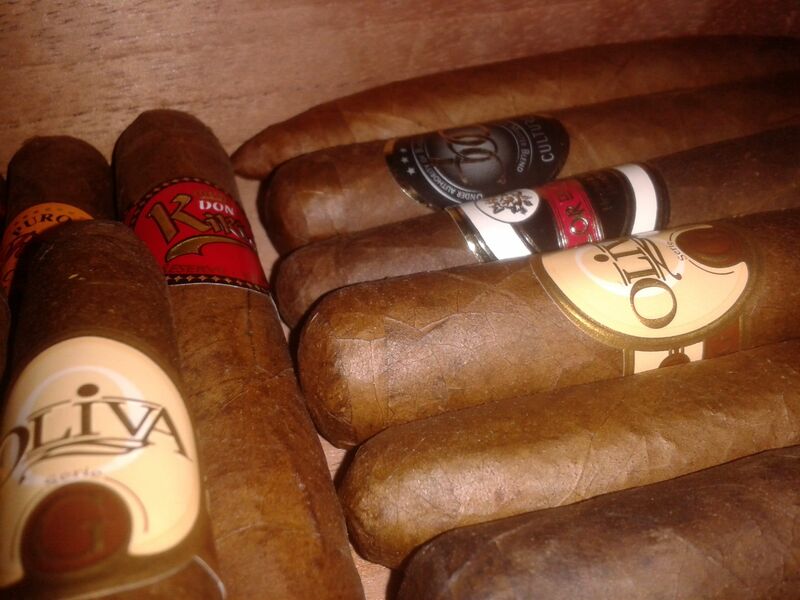 The Oliva Series G line is a Nicaraguan Cigar that packs lots of flavour. A true value at a price of €4.50. I’ve enjoyed this cigar on a few occasions and I suggest you do too. The Oliva Series G comes from a line of impressive cigars. Earlier in the year I enjoyed a Series V Perfecto but, have to say that I liked this one better. Maybe it was a bad roll or my humidor’s humidity was off, but the Perfecto went out a few times and I had to re-light it. As a result, I’m not sure I got all the flavours and transitions. Back to the Oliva Series G, some call the double Robusto size a “Wide Churchill” because normal Robusto cigars usually weigh in at a size of 5″ 50 or only slightly smaller and less wide. This cigar had a few transitions throughout its burn. Not overly complex, but enough to notice. Right away in the first third, an earthy smooth medium body cigar which has a simple medium draw. Don’t let simple fool you into thinking this is a one dimensional cigar. I was referring to fact that the draw is medium, but tends to be on the lighter side. This is for the most part how I like a cigar to be. From the start, the Oliva delivered pleasant flavours and a short finish that had hints of sweetness on its head. There were also touches of some dark chocolate. Depending on whether or not you double puffed or drew too many times you get some elements of spice. The cigar emits a pleasant smell, filling the air with a sweet cigar aroma of aged cedar. I had to admit it’s hard to control yourself. The flavours and ease of the draw make you want to puff this cigar quickly. The razor sharp burn and the fact that it needs zero touching up is ultra pleasurable. I couldn’t believe it, but the cigar took me near two hours to complete. I’m not sure if a sweetener was added to the head, this isn’t a complaint, it’s just an observance. An excellent cigar, well made and definitely well worth the cost. One last thing, I love the band and logo too. Cigars are like people, every good one makes a mistake sometimes, so always be willing to give one a second chance. Enjoy a good cigar review on YouTube.